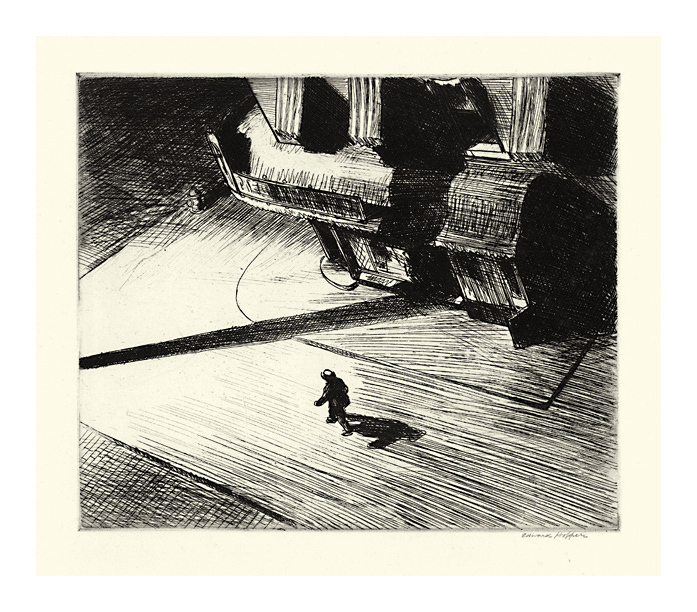 Night Shadows- - 1921, Etching. Edition c. 500. Signed in pencil. Image size 6 7/8 x 8 1/4 inches (175 x 210 mm); sheet size 10 x 11 1/2 inches (254 x 292 mm). A fine, richly inked impression, on cream wove paper, with wide margins (1 1/2 to 1 5/8 inches), in excellent condition. Reproduced: Prints and Their Creators, A World History, Carl Zigrosser, Crown Publishers Inc., 1974; American Master Prints from the Betty and Douglas Duffy Collection, The Trust for Museum Exhibitions, Washington, D.C., 1987; Whistler to Weidenaar: American Prints 1870-1950, Museum of Art, RISD, 1987, American Identities: Twentieth-Century Prints fron the Nancy Gray Sherrill, Class of 1954, Collection; Davis Museum and Cultural Center, Wellesley College; 2004; Artists & Prints, Masterworks from the Museum of Modern Art, The Museum of Modern Art, New York, 2004; Pressed In Time: American Prints 1905-1950, Henry E. Huntington Library and Art Gallery, San Marino, 2007. Exhibited: American Identities: Twentieth-Century Prints fron the Nancy Gray Sherrill, Class of 1954, Collection; Davis Museum and Cultural Center, Wellesley College; 2004; Pressed In Time: American Prints 1905-1950, The Huntington Library and Art Gallery, San Marino, 2007-2008. Collections: Achenbach Foundation for Graphic Arts, Art Institute of Chicago, The Brooklyn Museum, Museum of Fine Arts Boston, Davis Museum and Cultural Center, Metropolitan Museum of Art, M.H. de Young Memorial Museum, Museum of Modern Art, Morse Museum of American Art, National Gallery of Art, Philadelphia Museum of Art, Smithsonian American Art Museum, Whitney Museum of American Art. Image size 6 7/8 x 8 1/4 inches (175 x 210 mm); sheet size 10 5/8 x 14 1/2 inches (270 x 368 mm). A superb, richly inked impression, on cream wove paper, with full margins (1 3/4 to 4 1/4 inches), in excellent condition. 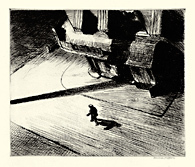 Sold as part of the rarely seen complete portfolio Six American Etchings, published by The New Republic, New York, 1924. In addition to Hopper's iconic Night Shadows the group includes the very scarce John Marin masterwork, Brooklyn Bridge No. 6 (Swaying); as well as Ernest Haskell's Sentinels of North Creek, Peggy Bacon's The Promenade Deck, Kenneth Hayes Miller's Play and John Sloan's Bandit's Cave. Each pencil signed, full sheets, and in excellent condition.